The Risk Simulation for Excel (Risk Analyzer) is an Excel add-in providing Monte Carlo simulation to model risk simulations on existing analytical models. Input and output ranges are defined as well as probability distribution dynamics for the risk simulation analysis. Simulations are run and results are automatically output to consolidated reports with user defined options. Simple to use and fast processing times. Example risk simulation studies are included along with step by step instructions. Provides a variety of probability distributions for modelling specific uncertainties. Funnel chart analysis visualizes the evolution of risk over time. Outputs sensitivity analysis and tornado/fishbone charts. 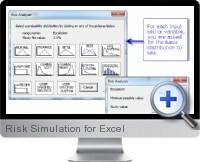 Excel risk simulation is compatible with all 32 and 64 bit versions of Excel.